SilenceBEseen-words, thoughts and pictures......: Midweek Healthy Eats with Chef Michelle: Clean up your eating! Midweek Healthy Eats with Chef Michelle: Clean up your eating! 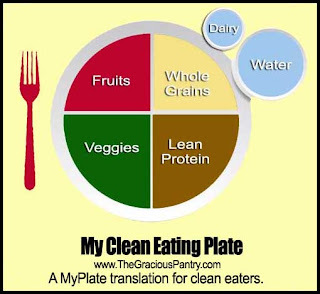 I’m sure you’ve heard the term “Eating Clean”… So what exactly does that mean? Eating clean is basically a diet of non-processed, fresh, natural (not man made) foods. You’ll notice that this ties into what we talked about last week regarding high and low vibration foods— Eating clean is a diet full of high vibration, unaltered foods. The fewer the ingredients the better. If you don’t recognize or can’t pronounce an ingredient, it’s best to stay away from it. Incorporate whole grains— brown rice, whole wheat bread, quinoa, steel cut oats, and other healthy whole grains. Water, water, water, water…. Need I say more? Lean proteins can be a great source of nutrients. Try grass fed organic and try to stay away from prepackaged meat… visit a local butcher. Cook at home, you have more control of what does or doesn't go into your food. Try out some of the Clean Eating recipes below. Fruits and veggies are your friends. Keep your plate colorful with lots of fresh produce. What are the benefits to Eating Clean? Eating clean is a great way to boost your mood from the inside out, literally. It doesn't have to be more expensive or crazy time consuming, just do your best to replace processed foods with something fresh. Instead of buying vegetables in a can, buy them fresh, it's just that simple. Hopefully you found this information helpful. Good luck in your Clean Eating Endeavors! Make sure you check out my Foodie Blog for more tips, recipes and foodie fun!